Details: An exceptionally fine and powerful portrait in wonderful condition of a Regency gentleman attributed by Christie’s. It shows the artist at the height of his powers. This very fine portrait in superb condition is fully attributed by Messrs. Christie’s to John Hoppner R.A.
Hoppner was one of the great portraitists of the English tradition. Thought by many to be the illegitimate son of George III he obtained entry into the R.A. Schools where his fees were paid by the royal purse. On graduation he was swiftly taken up by the establishment, again through royal patronage. However, his success did not solely depend on this, and by 1785 he was considered to be the most significant young portraitist, and the professional heir of Gainsborough, Reynolds and Romney. In about 1790 he became the first English portraitist to apply paint ‘with a flourish’ and this technique was adopted by Lawrence and Beechey. Hoppner took great offence when he saw the other artists emulating his style and stopped using it because he did not want to be associated with artists whom he considered to be his inferiors. He reverted to a more craftsman-like manner and his later works show the pure enjoyment of paint, its qualities and viscosity. His fame continued to rise until by 1800 he was at the top of his profession. 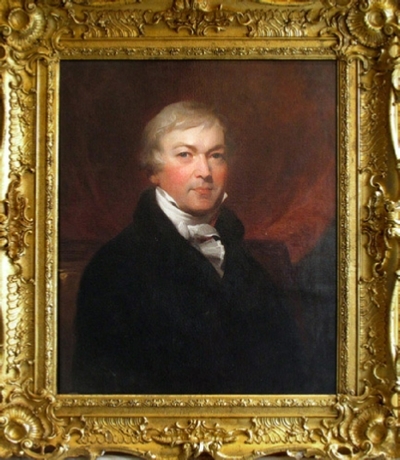 Lawrence eventually took over the mantle of top man when Hoppner died prematurely in 1810. This portrait is of an unknown gentleman and dates from c1805, when Hoppner’s powers had reached full maturity. The character in the face is compelling, the drawing superb and the technique used in painting the cravat is astonishing. The background to the head is painted in Hoppner’s favourite colour. The only sad note is the anonymity of the sitter. This is one of our favourite portraits and a wonderful focal point for any salon.